Please note, circumstances have since changed in some ways, but the chart continues to illustrate the complexity of regional political calculations as manifested in Syria. In reference to the video illustrating expansive Iranian engagement in Syria, Saudi Arabia's boycott of the UN Security Council, Qatari power games and Israel's latest air strike... please see my flow chart from August (copied below). Original post here. Below is my basic (for simplicity sake- only includes commonly known key actors) flow chart on the interrelationships between the primary actors in the Syrian Civil War. In producing this chart, my intention is twofold. First, to provide a basic reference guide. 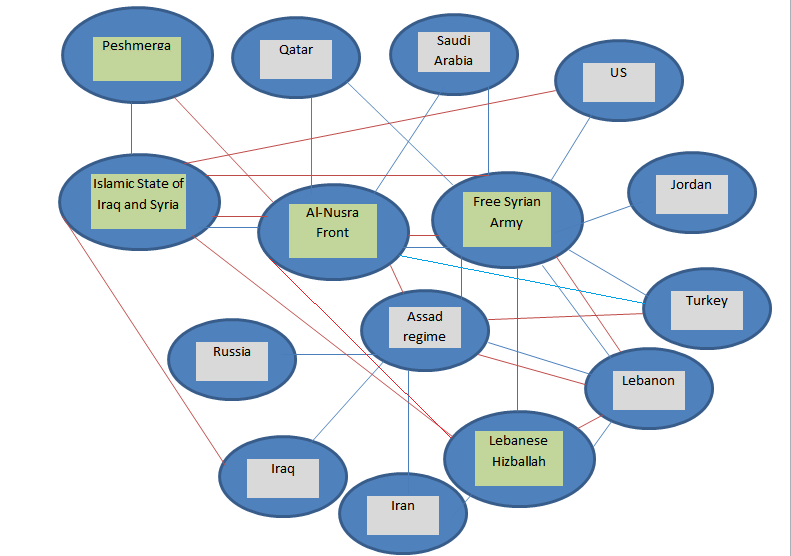 Second, to illustrate the degree to which Syria represents a proxy war between various actors with broader political interests - please see explanations below chart. 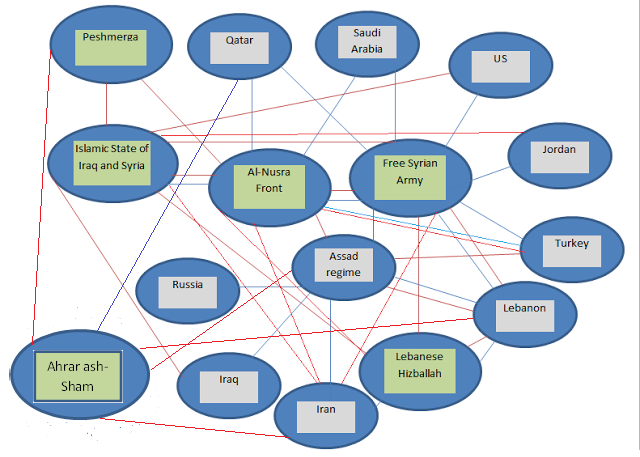 Please note - This chart shows actionable relationships (actively hostile/supporting, rather than simply ideologically adversarial) specific to the Syrian civil war. Non-state actors are shaded green and state actors are shaded grey. Red/purple lines indicate a hostile relationship and blue lines constitute an support relationship. As indicated below, a number of relationships are defined by both allied and hostile interactions. Also illustrated, when it comes to this civil war - the enemy of an enemy is not necessarily a friend. Ahrar ash-Sham - Anti-Assad Salafist Jihadis. Emerged under the leadership of a core of former prisoners of the Assad regime. Has since grown into a highly capable force. Presents itself as a hybrid Syrian nationalist-Salafist movement. Al-Nusra Front - Anti-Assad Salafist Jihadis. In contrast to the larger regional focus of the Islamic State of Iraq and Syria, Al-Nusra is more focused against Assad. Having said this, the group is accused of participating in the killing of Kurdish civilians in northern Syria (a troubling and under-reported element to the conflict). Free Syrian Army (FSA) - Formation of anti-Assad rebels. In basic terms, they're the less 'jihadist'/more nationalist counterpart to Al-Nusra. Primary recipient of western military aid. Lebanese Hizballah - Assad providing the key conduit for Iranian support to Hizballah, the group are resolute in their desire to maintain this critical relationship (even at serious cost). Iran - Iran is desperate to preserve their key ally. They're providing major investment towards Assad's survival. Iraq - Facilitates the Iranian logistics train to Assad. Islamic State of Iraq and Syria (ISIS) - Salafist Jihadis with a regional focus (hence alliance between branches). Possess a pathalogical hatred for Shia Muslims, the West and any/all who oppose their extremism. They oppose Assad, but do so in their larger pursuit of a regional caliphate. For all their particular disagreements with each other; Assad, the US and Iran are all desperate to constrain this group's growing power. It's notable that while states like Qatar, Saudi Arabia and Turkey are willing to provide support to Al-Nusra, their support for ISIS is far less significant (even they regard ISIS as too extreme). Jordan - The Jordanians are providing key facilitation for western efforts to train anti-Assad rebels. Lebanon - Lebanese society is sharply divided on the Syrian civil war. Angered by Assad's onslaught against a majority Sunni population, many Lebanese are vehemently hostile to his regime - a reality from which Hizballah's political opponents are trying to take advantage. In contrast, supporters of Hizballah (and others like Amal and General Aoun) stand in overt support of Assad. As a result of this dichotomy, tensions in Lebanon are increasing. Peshmerga (Kurdish militia forces) - Responding to reports of sectarian warfare by the Islamic State of Iraq/Al-Nusra against Kurds in northern Syria, the Peshmerga have taken a more active role in the civil war. Qatar - Plays major role in supplying Syrian rebels. This effort represents a broader intent to shape regional events in ways favorable to the monarchy. Russia - Supports Assad with weapons, funding and international legitimacy. Saudi Arabia - Supports both nationalist/salafist orientated anti-Assad forces with advanced weaponry. Regards the battleground in Syria as part of a larger proxy fight with Iran. Turkey - Enraged by what they regard as Syrian govt. propagated terrorism against Turkish citizens, Turkey has become a key opponent of Assad's regime. At present, Syria supports both the FSA and the Al-Nusra Front (though their support for the later may soon dissipate). 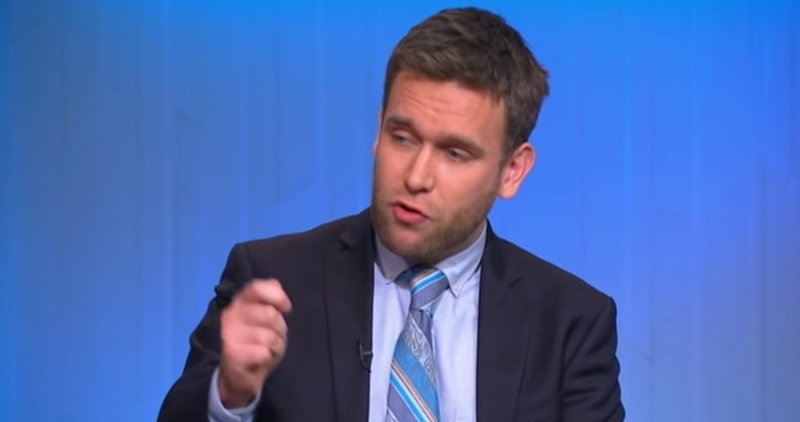 US - Seeks Assad's fall, marginalization of Iranian influence and the post-Assad emergence of a nationalist minded, pro-US democratic authority. *- ISIS still receives substantial funds from ideologically sympathetic individuals in the Gulf monarchies. If interested, links to my other MENA writings can be found here.